Maintaining an efficient and well-run production environment is an important key to success. It saves on unplanned downtime, cost and stress. You can do this by providing operational training programs, preventative maintenance, safety procedures and by providing equipment upgrades when needed. In order for a VFFS to positively impact the success of your company and plant operations, it is important to understand when an upgrade to your equipment is needed. Because this is a wide topic that could be covered in multiple articles, let’s narrow it down to electrical components. Specifically, when is it time to think about upgrading your servos and control panel? Upgrading the servos and control panel is actually an electrical conversion that entails much more than a servo or PLC. It also involves your HMI, gearbox, VFDs and other electrical components. It's an in depth process that requires preparation and downtime for the installation. 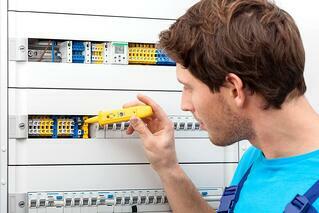 So, when should you consider an electrical conversion? One of the most frequent reasons for upgrading your servos and controls is to maintain the ability to go online with the machine and continue monitoring and troubleshooting the VFFS. As a vertical bagger gets older, the technology on the machine ages as well. During the maturation process, the engineering group and operators at most plants continue to update their equipment. At some point during the upgrades and equipment improvement, the modern computers are no longer able to go online with the machine. Let’s look at an example. A couple of decades ago, a common way to go online with a PLC was the RS-232 communication protocol, which would use a 9-pin serial cable. Unfortunately, most modern computers no longer have a 9-pin serial port. So, in order for a modern computer to maintain a connection to an older PLC that uses RS-232, you would need to get a USB-to-serial adapter or a similar method to bridge the gap. Technology changes and improves so quickly it can be hard to keep up at times. With a vertical bagger, the technology and parts involved in electrical upgrades can be difficult to locate. For example, if a manufacturer has discontinued a line of servos, it becomes difficult to find a replacement when the discontinued part stops working on your machine. There have been instances of individuals resorting to eBay to find old servos and controllers because the manufacturer no longer makes them. Sometimes it can be beneficial to repurpose older, existing equipment and when this happens the code may need to be upgraded as well. The form, fill, seal machine may have originally been working on a specific product or line. However, as product packaging needs evolve, the vertical form, fill, seal machine’s function may be switched to a new pouch design to accommodate the current needs of the plant. The electronics of the machine would then need to be updated to help meet the new requirements expected from the VFFS. This occurs when the new line needs to run faster, within tighter tolerances of a new product, or if the product is highly altered from the product that had been running on the machine previously. IS UPGRADING ALWAYS THE RIGHT CHOICE? Definitely not. Sometimes it is more convenient and cost effective to purchase a new machine. Let’s look at instances where a new machine may be the better option. As mentioned above, a machine that runs reliably saves you time and money. The older a machine gets, the more frequently the parts break down. At some point, it becomes a question of if it is more cost effective to upgrade your servos and control or if it is better to get a new machine. Documentation on your current machine plays a surprising role in this decision. When a machine is a couple of decades old, there is typically less documentation. This can be due to lack of documentation procedure, lack of current documentation technology, events where files may have been lost, or any number of reason. During the site visit, the time and service it takes for the manufacturer to get the information needed can outweigh the cost of purchasing a new machine. This situation may not occur often, however, there are times when you receive a vertical bagger from a company that is no longer in business. Or it’s possible that you have a line of machines from various manufacturers and would like the servos and control panel to be consistent. It is typically recommended to avoid upgrading the electronics and instead get a new machine. Again, lack of documentation and information on the machine plays a part in the determining if the cost outweighs the benefits. When the servo drive should be upgraded along with the entire machine. Being a successful company is the sum of many parts. If you have a VFFS, understanding your machine and its capabilities and effectiveness is crucial for ensuring it performs its function in attaining your goals and ensuring positive outcomes. Please let us know if you have any thoughts or other instances where an electrical upgrade was the best choice for your organization. Special thanks to Scott Lundberg for contributing his electrical engineering insight and knowledge to this post.